The StepperOut widget works with the Arduino and Adafruit Motor/Stepper/Servo Shield v2, and positions a stepper motor to a specific location in steps relative to the initial start location. Threshold – the widget will send the stepper to the “pos” as indicated in the interface when the main inputSource is greater or equal to the threshold (defaults to 500). The position can be optionally set by the input called inputStepperPos as set in the parameters. Continuous – With the continuousPosition parameter check true, whenever a new input value is received from the input inputStepperPos, the stepper will move to that new location. spd – Sets the maximum speed that the motor will move at. Note that speed is also affected by the acceleration parameter since the netlabtoolkitStepper software uses easing to accelerate and decelerate the motor as it starts and finishes its move. send stepper move – This button indicates when a move request is sent to the stepper. If clicked manually, it will move the stepper to the position set in the widget. Typically used to make sure the motor is working without the need for an input to the widget. acceleration – Sets how fast the stepper will accelerate at the beginning of the move, and decelerate at the end of the move. 300 is the default. continuousPosition – If set to TRUE, any values from the inputStepperPos source will cause the stepper to move that that location, essentially following the values as they come in. 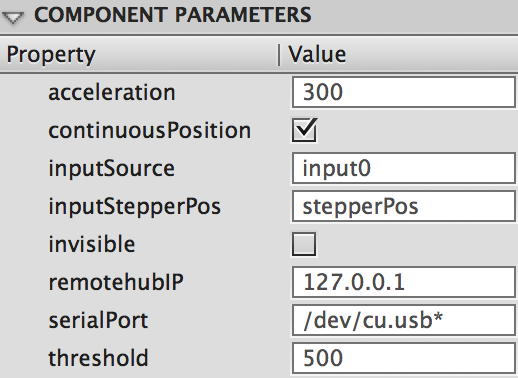 If set to FALSE, values received form inputStepperPos will set the pos value in the interface, and the next time the inputSource goes over the threshold, the stepper will move to the last location set for pos. inputSource – The instance name of the source the widget listens to, e.g AnalogIn or DigitalIn for moving the stepper when the input value rises above the THRESHOLD parameter setting. threshold – Sets the threshold value where the stepper will move if the value from inputSource is equal to or greater than this number. threshold – The value used for triggering a move of the stepper, when the inputSource values are greater than or equal this setting. These assume a StepperOut widget with the instance name of myStepper.